NetAcquire Corp Announces Software 8 Release! Kirkland, WA, May 15, 2015 — NetAcquire® Corporation announced today the release of generation 8 software. After 5 years of product development, NetAcquire Corporation is pleased to announce that version 8 software is now shipping! New NetAcquire version 8 product capabilities offer higher processing throughput with seamless multi-core processor support. Version 8 includes enhanced Web interface and navigation, as well as more network protocols including SFTP, DHCP, IPv6, and enhanced SNMPv3. New TCP/UDP communication device software allows for seamless networking, data sharing, and routing to/from any system function. Security hardening features include network firewall with port blocking and logging, memory protection, and access control permissions on files and directories. Also part of the new release is advanced Network Quality-of-Service (QoS) control for network prioritization and traffic control. Secure command line access for administrators using SSH, more flexible software upgrade/downgrade capability, and disk and file system robustness enhancements for harsh environments are also included. NetAcquire Telemetry-over-IP (TMoIP) adds additional functionality with support for more protocols and packet formats, including both UDP and TCP protocols, selectable standard packet configurations for RCC 218-10 (RTP and non-RTP), and soon RCC IRIG 106 Chapter 10. The new simplified but powerful Web GUI provides convenient end-to-end TMoIP configuration, control, and status. 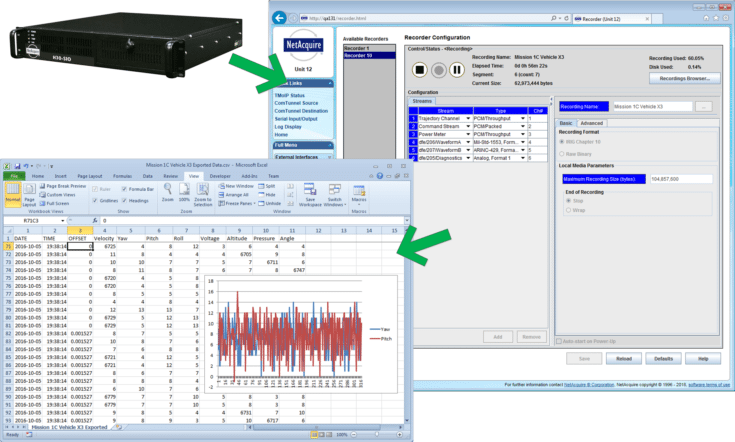 Network Auto-Tune capability performs automatic measurement and compensation for uncertain or varying network delay and jitter. Another new capability is the option to send two copies of each UDP packet to the same or different destinations for network redundancy and/or protection against dropped UDP packets. NetAcquire version 8 also supports the ability to bridge and route multiple IP networks across distributed locations. NetAcquire version 8 software includes a new real-time operating system, NetAcquire Deterministic Linux™ (NDL™), that provides 50 microsecond worst-case determinism/latency (500 times better than desktop Linux or Windows). For advanced or unique situations, NetAcquire continues its tradition of offering an open software environment that supports a wide range of customer-supplied programming enhancements and extensions. The version 8 NetAcquire Server Extension Toolkit boosts programmer productivity with a preconfigured Integrated Development Environment (IDE) and a coding wizard for auto-generating starting projects for different extension types. Programmers will also appreciate one-click upload and deployment of extensions as well as integrated source code debugging. NetAcquire Corporation, located in Kirkland, WA, provides real-time distributed hardware and software, data acquisition, and communications solutions to aerospace companies worldwide. For more information on NetAcquire version 8, including software upgrade options, please contact NetAcquire at support@netacquire.com or 888-675-1122. NetAcquire is a registered trademark of NetAcquire Corporation. For full press materials, including product photos and editorial overview, please visit Press Releases.